Question for the Reader(s): If you have had pain in the bottom of your heel, what 1 treatment do you think was helpful/most helpful? If you have more than 1 you would like to discuss, please do a separate post. • Always drain blisters as soon as possible and use a sterile pin or needle. • Sterilize the needle or pin with rubbing alcohol or passing it through a flame, when letting it cool for 30 seconds. • Before performing the procedure, and try to make Marcus Welby MD proud, make sure you have topical antibiotic, band aids big enough to cover completely, gauze to collect the fluid, and moleskin or athletic tape to cover the band aid. • Push the fluid towards one side of the blister and puncture the dead top layer of skin keeping the needle/pin parallel with the skin, sort of above the fluid. • Do not push the needle/pin into the live, deep layers of skin below the fluid. • You must puncture the skin 3 to 5 times in different places to ensure that the top will not just reseal over and allow a new blister to form. • Even with the best intentions, 30% of all blisters have to be popped again. • After popping the blister, soak in warm water in a basin with two tablespoons of any type of salt for 30 to 60 minutes (the longer the better) to pull out the fluid. I do like the sound of the SALTS from the DEAD SEA. • After soaking, dry off the blister well, apply topical antibiotic over the holes made by the needle/pin, or any other exposed, open skin, and cover with a band aid(s) bigger than the size of the blister. • Place with firm pressure tape or moleskin over the band aid(s) to give an added push on the roof of the blister to re-seal with the underlying skin. • Take off the dressing twice daily to soak for 30 minutes until all the soreness is gone. It is so important to continue soaking until the soreness is gone to pull out extra fluid and inflammation. This can take 1 to 7 days based on the size and depth of the blister. • Once the soreness is gone, the dressing can be removed except when you are in a situation that a re-blister may occur (perhaps that next hike!). • Keep moleskin or tape over the old blister area for 2 weeks more to protect against re-blister. It is extremely important to massage softening creams or moisturizers into the area for these 2 weeks to re-soften the skin. Massage twice daily for 2 minutes. All the soaking you do in the first week dries the skin and deep tissues. • The goal is to get the skin soft again and the deep tissue not inflammed. • When the blistering process is severe with skin breakdown and exposed deep tissue (loss of the roof), use one of the over the counter medicines in the water while you soak. See if your pharmacy has any one of these powders or liquids: Domboros, Pediboros, Bluboros, and Burrows Solution. Follow the directions for concentrations. • The medicated powders or solutions listed above are so powerful drying agents that you immediately have to twice daily use the softening/moisturizing creams on the skin. • With the severe blistering, more skin protection is also needed like big squares of moleskin attached only to good skin, Silvadene-like silver tainted ointments, and perhaps some padding. The silver ointments are anti-bacterial as well as great for the skin. Ask the pharmacy. • What if the blister is possibly infected? So you pop the blister and pus comes out, immediately see a doctor. • What if the blister has blood? Blood is the food of infection. 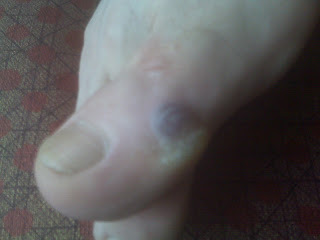 Blood blisters must be taken a lot more seriously, and drained as quickly as possible. If you think it is getting or is infected, see above and see a doctor. • Every year I have to have an infected blister hospitalized or, at least, see an infectious disease specialist. I hate infections!! Coban Wrap was supposedly invented by a very smart engineer at 3M Company two years before he invented the glue for post-its. Both products have helped me and I am very grateful. Coban does not stick to your skin. The tape also has a latex-free version and can be found at www.3M.com/ The tape is corrigated to bind to itself. It is a stretch tape, so it gives with swelling. With any wrap, it should not be used if someone as poor circulation, but especially if they lack feeling. When you wrap a foot, or toe like in the photo above, you must be able to feel when it is too tight and should be loosened. It is fairly water-proof, so you can shower with it, and the skin dries under it. I have had patients leave on to protect a corn, or other sore, for a month at a time. The photo above shows the tape being used for compression following a broken toe. This will be on totally for 12 weeks to control the swelling and minimize the pain associated with this swelling. There will always be some stabilization of an injured area with Coban which can help speed healing of fractures. "Buddy taping" is when you tape a broken toe to the toe next to it for greater stability. First you wrap the injured toe completely, then continue the tape over the next toe. The big toe can not be buddy taped. The second toe if broken is taped to the third toe. The third toe if broken is taped to the second or fourth, whichever feels the best. The fourth toe if broken is taped to the third toe. The fifth toe if broken is taped to the fourth toe. The normal amount of time of taping is 3 months. The permanent cast by far produces the most problems, but even the removable casts can be very destructive. In the rush of reviewing the x rays or MRIs, making the decision to cast, and orchestrating that the proper cast is applied, many simple suggestions are forgotten that can minimize some of the effects of cast disease. If you have a foot/ankle cast, make sure the opposite foot is raised up evenly. A product called EvenUp® can be applied to the shoe on the opposite side to keep the knees, hips, pelvis, and spine level (as demonstrated in the photo above). Find out what cardio you can do to keep the heart/lungs strong (and remember the HDLs) and contain weight. Some walking is normally allowed with weight bearing casts as the soreness resolves, but stationary bikes on a daily basis can keep leg strength and adequate cardio. Normally you can do pain free isometric strengthening exercises within the cast, but a physical therapist will have to show you how to do these. Normally, push painfree into the cast in all 4 directions, hold for 6 seconds, and repeat 10 times. Do these isometrics 3 times daily. Sometimes, it is appropriate to order a muscle stimulator. This can even be placed on inside a permanent cast to begin strengthening as soon as possible. This is normally ordered and applied at the 2 week cast change. As soon as the cast comes off, you may not be able to increase cardio, but you should be able to increase strength, flexibility, range or motion, and proprioception. Find out what exercise you can do as quickly as possible without risking harm. Keep pushing the doctor and/or therapist to move your rehabilitation along. A prescription for 3 physical therapy sessions (normally once every 2 weeks) can progressively build a home exercise program that you do daily. Golden Rule of Foot: For every day you are in a cast,it takes 2 days to get back to normal. Your job, if you choose to accept it, is to move the rehabilitation along as quick as possible, without causing increased pain. Pain causes swelling, which causes more pain, which causes more pain, and the cycle spins out of control. Be your own advocate, ask questions, make sure speedy rehabilitation is part of all those involved mindset for you. Tell them you want to soak to reduce swelling, you want to do exercises for strength, flexibility, range of motion, and proprioception. Tell them you need to get safe but effective cardio as soon as possible. Keep it moving! Another Golden Rule of Foot!! April 19, 2010 and the 114th Boston Marathon is now completed. Marathon season to me is now officially begun, although I know there has been a few so far this year. Something about the Boston Marathon is so magical---memories flood my brain of Bill Rogers, Alberto Salazar, Greg Meyer, Miki Gorman, Joan Benoit, and Jacqueline Hansen. What athletes they are!! What excitement they brought for all marathoners when 10 years before most Americans had barely ever heard of a marathon. Yes, 26.2 miles long, but arguably the greatest single athletic feat the average athlete/person can actually do!! Why? I also believe it is beyond doubt proof that the human body is meant to run. It is natural for us to run. My good 2:56:34 as a 21 year old would only be the world record for 70 year olds. Maybe I will journal my marathon training soon!! The photo is of my son Steve after 14 miles on his way to conquering the 2007 San Francisco Marathon. He didn't win, but everyone is a winner!! For those of you ready to start training for your first marathon, I will be happy to help. Post your questions to this blog post. If you have a question others have the same question. I love this part of sports medicine. In 1984, I was the medical director of the San Francisco Marathon in which over 10,000 runners finished. It sadly has never been that big, but it is coming back in popularity!! In the 70s, it was marathon training that got me first interested in podiatry. I ran 4 marathons in the 1970s before I ever heard about podiatry. Podiatrists were keeping runners running. Most in medicine were saying how bad it is for your joints. But it is not bad for your joints!! Bad training is bad for your joints!! Bad shoes can be bad for your joints!! But marathon training is a natural activity for the human body, and we can excel in it. Go for it!! But Listen to your body! I will title my Marathon Training Schedule as Dr. Blake’s Gentle Marathon Training Schedule. Give yourself 6 months to properly train. Use my friends at Team-In-Training to help. www.teamintraining.org/ What an incredible service they provide! My schedule is based on 4 days running per week. For 30 years it has been helping athletes achieve this incredible goal. You must have a long day each week, in which I will use Saturday, but the days can be slightly rearranged based on individual schedules. What is non-negotiable is the off day before the long run and the light jog the day after the long run. I love Grete Waitz’ (9 time NY Marathon Winner) rule of 3 up 1 down as the mileage builds and I have adapted a modified version. This is based on total weekly mileage. Time your first week with the weeks left before the marathon you want to run. Then, step out of your comfort zone and go for it! • Faster tempo runs on Tuesdays and Thursdays to build up leg speed (never on track as intervals or focusing on hills for the beginner). These runs should be a comfortable pace. One very common change based on how the athlete feels is to remain for 4 weeks at levels 7, then level 13, and finally level 17. This is done to add 9 weeks more to the over-all program when the running is going slow with too many aches and pains, job interruptions, building better leg strength, or simply timing the date of the marathon. I love Sole over the counter orthotics. I always have my patients get a soft athletic version and I can modify if needed. The company now has socks and sandals. The sandal, if the arch contour is tolerated by your foot, is one of the best on the market. I, of course, have no financial ties to any product (yet). I tell my patients to always try the orthotic first before heating to mold to your foot. The molding process will always slightly flatten the arch, and if you can tolerate the original arch, go for it!! 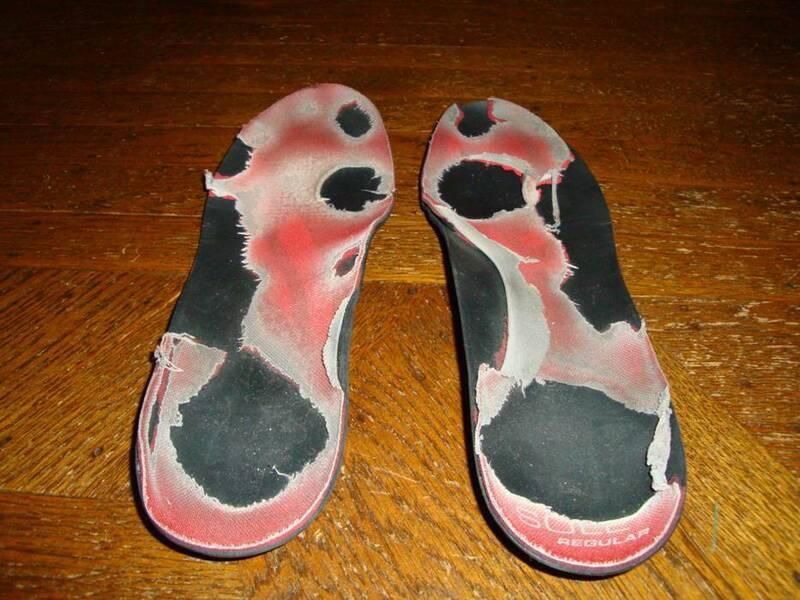 Golden Rule of Foot:Once a month place your running shoes on a flat surface and look at the heels from behind. You will be able to notice if one side or both sides are beginning to lean inward or outward (as illustrated in the photo above). When this occurs, it is important to get a new pair of shoes immediately. I think that this is good practice when buying athletic shoes in general. A shoe should always feel stable, but it must look stable or centered from this back of the heel view. You can see from the photo above that the right side is leaned to the outside more than the left. This is called excessive supination or lateral instability. The lean to the left in this runner whom just happens to be my wife Pat can be caused by a short leg. When you watch someone walk, there may be a slight lean to one side which is very consistant. This is caused by many problems, including scoliosis and short leg syndrome. When evaluating for a possible short leg, look for this lean known as "limb dominance". Pat is demonstrating left side dominance. If you have received lifts for a short leg, the lifts should eliminate all or most of this lean. Never use lifts if the prescriber does not watch you walk and/or run with and without them documenting their success. Never use lifts if the lean is made worse by the lifts. If your symptoms seem to be getting worse with lift therapy, stop using lifts for a week to verify that the symptoms are being caused by the lifts. When you are walking along, do you ever notice you always drift to one side or the other? Do people who walk with you comment that you always bump them if they walk on your right or left side? Do they sometimes joke that you won't pass a sobriety test even when sober? If you walk with hard soled shoes on a hard surface, do you hear one side landing harder (greater sound)? These can all be clues of a short leg. With a short leg, you may lean to the long or the short side, but most adults lean to their long side. I will have another post on the best way of measuring for a short leg. In my practice I treat short leg for many reasons, but the most referrals I get are for hip and low back pain patients. Ilio-tibial band syndrome is also commonly caused by a short leg. When a patient is always injuring the same side, even though different areas, think short leg syndrome. Lifts to correct for the uneven hips and pelvis can allow the muscles to function equally on both sides of the body easing stress points and allowing muscle imbalances to correct. If you have any clues you may have a short leg, and you are having pain, perhaps lift therapy to correct for the short leg may be helpful for you. Most patients have a short leg, either structurally or functionally. A structural short leg is true length difference of the bones, where a functional short leg may be caused by many factors including one arch lower than the other side. As long as one arch collapses more than the other side, the short leg syndrome exists. Most people have one foot longer than the other, but the long foot may or may not be on the long leg. Remember you are taught to buy shoes always for the longer side (longer foot). If you wear out one shoe more than the other, either by observing the heel of the outersole or the footbed within the shoe, you can tell that one leg may be shorter. Orthopedists normally do not recommend treatment unless over 1/2". Podiatrists have observed that as little as 1/8" difference in leg lengths can cause symptoms. By treating these small differences, and having patients report positive outcomes, leg length discrepancies are a vital part of care. Treatment of leg length discrepancies is with various types of lifts under the short leg. The photo above shows a shoe with a full length external or outersole lift of 3/8". 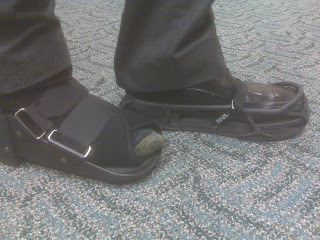 Due to the swelling in his foot, this patient could not tolerate any lifts within the shoe. Full length lifts, whether within the shoe or on the outer sole, are normally so much more stable than just heel lifts. Heel lifts alone can create a high heel effect with more instability. Also, a heel lift alone can be compensated for with mere bending of the knee negating the desired lift height. So, I love full length lifts and try to always start with these in my treatment. A future post will explore this treatment in detail. Most athletic shoes can accommodate up to 3/8" lifts. All patients should have a trial of lift therapy with shoe inserts with positive results before external shoe lifts are utilized. Most shoe repair shops can put on external lifts, but there may be one in your area that specializes. Ask around for referrals from local orthopedic or podiatry offices. The external lift must be tapered at the toes, and somewhat flexible at the ball of the foot, to allow the patient to walk smoothly from heel to toe. The Golden Rule of Foot with lift therapy: Start Low, Go Slow. Normally, if the difference is 3/8" total, 1/8" lift is given for 2weeks, then another 1/8" lift for 2 more weeks, then finally the full 3/8". As you go up in lift therapy, blame any new symptoms on the added lift, take out the additional lift until the new symptoms subside, then try again. Some patients are stuck for one reason or another at one level of lift. Their bodies will reject the higher amounts. There seems to be more stress on the body when the exact same lift is placed on the outersole as was originally used as an insert. It probably weighs slightly more, or effects the motion around heel strike more. To lessen this change, which may cause symptoms itself, place 1/2 of the overall lift in the opposite shoe as an insert initially. Two weeks later, take 1/2 of that away, then finally 2 weeks later take it all away so you are left with just the desired outersole lift. This eases the process dramatically, allowing the body to relax more in making this big change. Good luck!! 1) Medium toe separators or spreaders (www.FootSmart.com) highlighted in the photo above. These are to be worn with any enclosed shoes. 2) Yogatoes or knockoff 20 minutes at least 3 times weekly. 3) Ice massage (when bunion sore) or moisturizing cream massage 5 minutes 2 times per day until the skin looks normal. 4) Adhesive padding(www.mooremedical.com) not over the bunion or on the toe, but just behind the bunion toward the arch in any tight shoe. You place on your foot as close to the bunion as possible before you put your sock on. Never put under the foot. Should be about 1" square, buy 1/4" thick, but cut down to not show. 5) Wear shoes that do not press (perhaps squared toe or no reinforcements across this area). 6) If your foot pronates inward, arch collapse, you need to support the arch with a stable shoe and some sort of arch support. The stable shoe is most important, but an arch support that takes weight and centers the pressures in your foot is vital with pronators. Patient seen on 3/30/10 with a 10 day history of pain in his metatarsals was highlighted in post entitled: Patient Footlight#1: Possible Foot Stress Fracture. The x-ray taken above was during the follow up visit on 4/7/10. The patient was already feeling a lot better with the removable cast. Contrast bathing was initiated at the 1 hot 1 cold cycle (see the post on the secrets of contrast bathing). The x ray shows the subtle new bone formation (just above the magnifying glass marker) seen in stress fractures. You actually never see the fracture line unless the stress fracture has turned into a full fracture. The patient was again reminded about Calcium and Vitamin D. The patient will spend 6 weeks in the cast, then begin to gradually wean out of the cast over another 2 week period. Golden Rule of Foot:The patient must be two weeks totally pain free in the cast before the weaning process begins. No increase in pain is tolerated during the weaning process. The patient is followed every two weeks. With metatarsal stress fractures, plastic orthotic devices for a balancing function (see post on Orthotic Devices: General Principles) are normally ordered 2 weeks prior to the weaning process. This insures that the patient is walking with orthotic devices and with the foot taped with every step when out of the cast. These orthotic devices are worn for up to 2 years in athletic/strenuous activities to prevent re-injury. This particular patient walks everywhere in San Francisco in our very hard cement jungle. Taping (to be taught in a later post) is also used with strenuous activities. Since bones first heal, then double heal, symptoms related to increased circulation can last for many monthes after the stress fracture heals. It is important to do the contrast bathing daily, and ice after strenuous activity, until all symptoms have been gone for 2 weeks straight. The contrast bathes continue to flush out unwanted swelling and the icing minimizes the aggravation of symptoms. A wonderful patient whom I saw 22 years ago came into our very busy office with complaints of pain in her right Achilles tendon from walking her very big dog. She thought since she always held the leash with her right hand she must of pulled the right Achilles somehow. Very smart observation! She had only taken off her right shoe when I came into the room. I was very busy that day running late with all of my patients. After examining her Achilles, her diagnosis and treatment plan seemed straight forward. I turned to leave the room to get our physical therapist to put her on the proper icing and stretching regimen, but something told me to have her take off the other shoe. Golden Rule of Foot (for practitioners): Always look at both feet. When she took off the other shoe, it was evident that she would never see the physical therapist that day. This patient turned out to be a brittle diabetic with an infected ulcer on the left big toe. We became good friends as I visited her twice daily in our hospital over the next 3 weeks. I still see her monthly. As an adult-onset diabetic, she never really owned/accepted her disease. Her blood sugars were terrible with the bacteria feeling very happy like kids in a candy store. On that day, the statistics for a diabetic to survive more than 5 years when presenting with an infected ulcer were very small. Statistically, she should have definitely lost her leg. 22 years later she is still going strong, both legs and all. See the link below for Diabetes Self Care and Footsmart catalog for ordering a floor mirror. Having her take off the other shoe may have saved her life that day. But I hope this message of checking both feet saves thousands from amputations and death. Let's be very greedy. Diabetes is a killer, but owning your diabetes, can allow you to have a great life. Golden Rule of Foot: Diabetics should daily exam the bottoms of their feet. I think back on that day almost every time I see this patient. Relatively new to the practice of medicine, I learned a valuable lesson. The rush of medicine nowadays will allow this scenario to play out over and over again in various forms. Patients must become more responsible for their own health. I do not know why I took off the other shoe that day. I was in a rush, way behind. But I did and I am proud that I try to continue to take the extra time. Patients all have a story when they come through our doors. The stories add wonderful color to the practice of medicine. Let’s get better at listening to these stories. Dec 18, 2009 ... Diabetes can be dangerous for feet; to avoid serious foot problems follow these guidelines. Shop FootSmart for Comfort Shoes Foot & Lower Body Health Products. FootSmart is a cost effective online shopping website for various foot and leg devices. Many of the products that I mention in various posts will be found at www. FootSmart.com. You may ask to get their catalog delivered to your home or office. My patients have benefited immensely when self-exploring possible inexpensive solutions or aids to their foot ailments. Since patients know their bodies best, they come up with the remedy or partial remedy to their problem within the covers of this catalog/website. Running is one of the safest activities out there. Running seems natural for the human body and can be done relatively safely. Many athletes need great shoes and orthotics, especially if their mechanics are somewhat off, but the average runner can actually run a marathon. This implies good training, but the human body seems to withstand the stresses of marathon training (a truly incredible task) with relative ease. There is really no other feat this impressive that thousands upon thousands of athletes accomplish each year. But the first year of running is what separates the men from the boys, the women from the girls. In my 30 years of practice, I have found that the first year of running is the crucial survival year. Getting through this first year with its ups and downs, injuries, and discomforts, is very challenging. It is in itself a huge accomplishment. Learning about training, proper shoe selection, pace, what pains to ignore or take seriously, is all part of developing a BASE. Developing a stable base is one of the most important keys to a long running career. Patient presents with 10 day history of pain in his left foot. There was no acute injury that the patient remembers. Pain was first felt waking up in the morning. Few days later, bruising and swelling were noticeable at the top of his foot in the metatarsal area. Patient normally walks everywhere. Now pain develops after 6 blocks, but has no pain walking flatfooted around his apartment (pain only with bending his toes in push off). He noted that his walking shoes were fairly broken down on self examination. Pain level, on a scale of 0 to 10, was around a 7. Patient states he takes no special supplements, except vitamin C, but does feel he has a healthy diet. Examination showed swelling and redness on the top of his 2nd and 3rd metatarsals. Significant pain and swelling like this in this area of the foot is a stress fracture until proven otherwise (golden rule of foot). With a sprain of the tissue, you probably would have had to have tripped. With any swelling or redness in the foot, gout or infection must be in the examiner’s differential diagnosis. There were no open wounds suggesting possible infection. Gout however could not be ruled out at present. I advised the patient that stress fractures may not show for 2 to 3 weeks on x-ray. Many patients get xrays during this time frame only to be told they have no broken bones, when they really do. He was given an x-ray Rx for the next week if he was not getting a lot better. We discussed the role of a good healthy diet, 1200mg to 1500mg of calcium daily, and 400-1000 units of Vitamin D daily(see links below). He was told to ice pack the area to calm it down 2 or 3 times daily for 10 to 20 minutes each time. Please see the post on Ice. 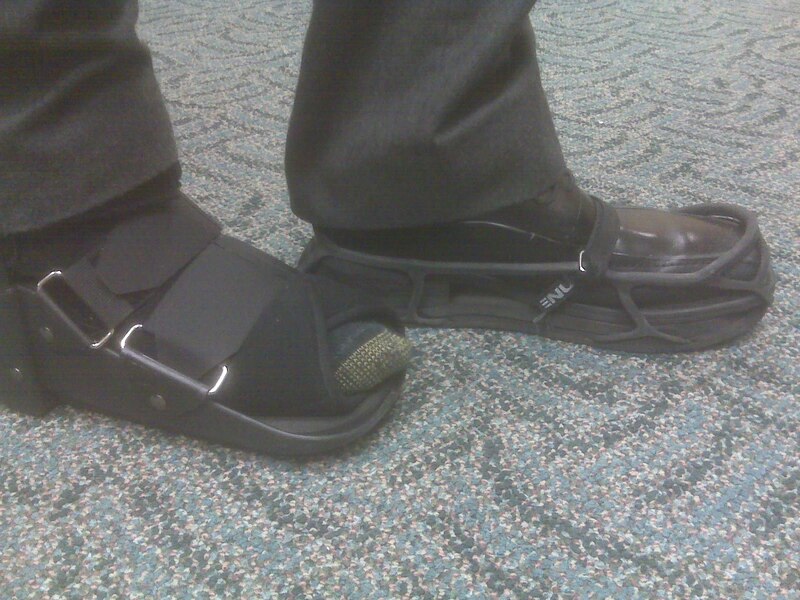 After discussing his options on footwear, since he walks daily a significant amount, he purchased a removable cast for the injured side and an Even up® www.EvenUpCorp.com for the good side as shown in the photo above. He was also given a compression sock for 24/7, and advised on some elevation AMAP (as much as possible) to shrink swelling, at least getting his feet off the ground. For around the house, he purchased a post operative shoe with a stiff sole to avoid bending his toes. The removable cast works well since it has a built in rocker so you do not bend your toes. Can you recognize all the basic components of R.I.C.E. at work here? Follow up of Patient #1 will be given when appropriate for teaching. This patient, as with all I will use in my posts, has given his permission to use the basic information of their care for teaching purposes. Golden Rule of Foot: When designing or wearing orthotic devices for plantar fasciitis, the patient must feel the weight is being transferred from the painful heel area into the arch, and the patient must feel that the heel area is being suspended or cushioned. Without these 2 factors occurring, the orthotic devices will not be as helpful as possible. Golden Rule of Foot: When in doubt to heat or ice, use ice. The goal of ice or cold water is to control inflammation, minimizing the swelling which occurs following an injury, or an aggravation of a previous injury. Why is this swelling so bad? Actually, swelling does get a bad name. With this increased blood flow to an injured area, the body brings in the building blocks for healing that injury. Very important!!! However, the body normally over does it, opening the flood gates to excessive swelling that can get in the way of healing. A simple ankle sprain can be swollen for weeks and weeks. It is the excessive swelling that slows the healing process by cutting off the micro-circulation to the area. Chronic swelling in the achilles tendon for example has been known to completely stop the healing process. This excessive swelling also adds excessive stiffness, adds instability by floating joint surfaces, and interfers with normal motion. It is the excessive swelling that must be minimized by immediate treatment of acute injuries or sudden aggravations of previous injuries. There will soon be a post of R.I.C.E. therapy for acute injuries that everyone learns in high school/college, but somehow most forget. The I. stands for Ice. As soon after an injury you can put ice on, the faster it will heal!! All athletes know that by controlling the swelling, injuries heal so much faster. The basic sciences teach us that the inflammatory phase of an acute injury lasts around 4 days. Heat in any form is considered the enemy during this time. Therefore, most teach ice for 72 to 96 hours after an injury or aggravation, then switch to heat only. This, however, does not take into account that symptoms will go up and down based on gradually getting back to full activity. Therefore, ice can be used in some form or another for months. I commonly recommend an ice pack or soak after strenuous activity during the return to activity period for 2 weeks longer than anyone (doctor, therapist, or patient) thinks necessary. It is that important. Ice gets a bad name since it minimizes blood flow after those initial 4 days. Some believe ice should never be used after the first 4 days. But patients continue to push the limits as they rehab, needing ice sometimes for up to a year after strenuous activities. We all want normal to better blood flow after an injury. But excessive blood flow from utilizing too much heat at the wrong time (following aggravation) can slow the healing way down. The best way of applying ice is soaking with ice water getting the temperature around 55 degrees. 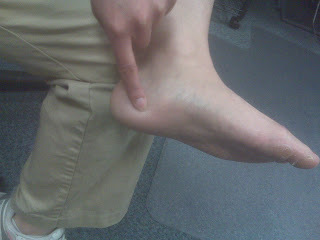 The patient in the photo above is ice soaking for 20 minutes following a cortisone shot to the heel. This is usually attained by cold tap water and 1/2 tray of ice cubes in a 3/4 filled basin. However, if you have cold sensitivities, poor circulation, or are experiencing nerve pain, please consult your doctor/therapist before using this cold environment. Soaking in cold water is normally for 20 minutes, and the foot remains stiff for approximately 1 and 1/2 hours after this. No physical activities are allowed in this time period. The stiffnes could lead to other muscle pulls, etc. Ice can be applied sometimes easier, and less painfully, with cold packs. These may or may not be reusuable. Never use a reusuable ice pack that is stiff; it should be soft and malleable when applied to your skin. Normally, these can go directly onto your skin, but many prefer a moist towel between the ice pack and the skin. Some skin surfaces are too sensitive for direct ice secondary to nerves or bony prominences. The towel must be moist with cold water to allow the full effect of the cold to penetrate your skin. Patients have used frozen peas as ice packs for years successfully. Supposedly, frozen corn or mixed vegetables hold in the cold better due to the denser material and last longer. Definitely mark the packages "Do Not Eat." You can use ice packs 20 minutes every 2 hours to quickly calm an inflammed area as long as you pay attention to the circulation. Unless you have to ice pack the bottom of your foot, most patients can perform ambulatory multi-tasking with ice packs somehow secured to enable them to get around. Ice soaking does not allow ambulatory multi-tasking. When you have a small inflammed area, like a bunion, you can use ice massage effectively. Take an ice cube in a towel, and using circular motions, gradually massage the area for 5 minutes. As the minutes pass, massage deeper and deeper into the tissue. The massage helps push out the fluid, while the ice calms down the inflammation. Ice and massage is a powerful way of eliminating inflammation. Many will freeze water in a dixie cup, peel away the top of the cup, and then massage. The frozen sport bottle routine for plantar fasciitis is another example of ice massage commonly utilized. Fill a plastic bottle 1/2 with water and freeze it standing up (not you the bottle). The water expands during the freezing process. Place a towel on the floor and then the bottle. While you are sitting or standing, gradually with more pressure roll the sore area over the bottle for 5 minutes. You get the most effective self-treatment ever by mixing anti-inflammation, massage, and stretching of the injured tissue. After a 5 minute ice massage, the area remains tight for 30 minutes, so avoid strenuous activity during this time. For example, do not run right after ice massage. The final form of ice used commonly is Contrast Bathing. Please see the post entitled "Secrets of Contrast Bathing" for a full discussion. This slowly introduces heat into the rehabilitation. Soaking in warm water after the first 4 days of an injury or aggravation in a mild injury is very soothing. The injured area normally feels great with this for 1 or 2 hours, but then the negative effect of the heat may surface causing overall more swelling and stiffness. As you start to use heat, be willing to listen to what your body is saying. Generalizations may say one thing, but your body the other. Only if you understand the basic principles, can you experiment successfully with these very powerful tools of rehabilitation: Heat and Cold. I hope at least some of the basic principles are now clear. Into Triathalons, please look at this website. I have personally worked with Marc Evans for over 20 years and his world class tri-athletes. Marc has a great facility in Tahoe area. Marc has written multiple books. From the novice to expert, Marc Evans can be an excellent guide in this difficult event.